For those of you who have followed Better Place since day one, the company’s original idea of swapping battery packs facilitating longer electric vehicle drives have fascinated the industry. There is only one problem. How do you get the automobile industry to agree on standards to swap batteries? In a previous article last year, I wrote about Better Place here; Battery Swapping To Seduce You To Buy Electric Cars. Shai Agassi and Better Place. The idea was good but maybe premature for its time. Carmakers are not ready to embrace battery pack standards. That would mean creating complete section for all cars for standardized battery packs. While the idea has merit both financially and technically, Better Place reached too quickly globally. 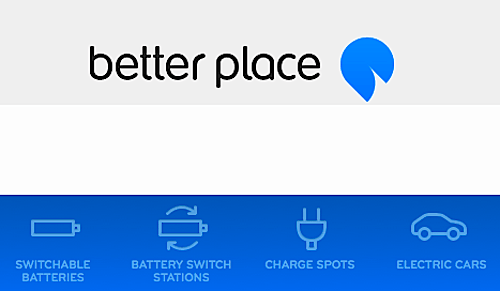 Better Place soon realized it needed to include an electric charging network. From Shai to Evan Thornley. Unfortunately, Better Place has run into a series of negative high-profile news culminating in the departure of their current CEO, Evan Thornley, the third CEO in the company’s short history. Does this mean Better Place is out? Most likely not since it has laid out its foundation for battery swapping stations in Israel and Denmark but it means it needs to recoup and focus. Bye-Bye USA & Australia. With this in mind, Better Place is now moving away form the USA and Australia and will concentrate on its original markets in Denmark and Israel. The Palo Alto office, that was to establish an electric taxi program linking San Francisco, San Jose and Oakland, according to Forbes will close as well as the one in Australia. High Profile Partners. Early on in the game, Better Place struck a partnership with the Nissan-Renault Alliance. Renault would sell its all-electric Fluence with Better Place’s battery swapping technology with a full roll out in Australia by 2014. Unfortunately, Better Place retracting from Australia puts these plans on hold, but most likely not in Denmark and Israel. According to U.S. CEO Dan Cohen on GreenCarReport: "We need to prove to our customers, suppliers and investors that we have a sustainable, scalable model. To do so we are now focusing on realizing the full potential of what we have built, and that means concentrating our resources and energy in the near term, on Denmark and Israel, where we have customers on the road enjoying our switching and charging networks. At the same time, we had to make some difficult decisions on actions to be taken elsewhere in the world." We hope Better Place will continue its advance into a sustainable charging station network while it solves the intricacies of battery pack swapping at designated stations. In the meantime, it makes sense for Better Place to regroup and concentrate where it has the most chance, Denmark and Israel where they are fully backed by local governments.